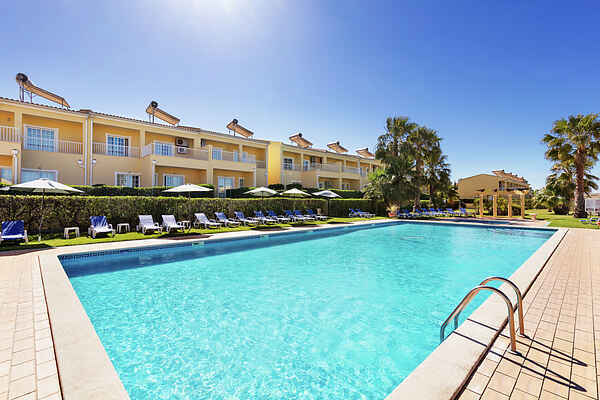 The Trade Fair apartments are located within a protected area in the village of Pera, near the bustling resort of Armacao de Pera, 5 minutes by bike from the wonderful Praia Grande beach in the Algarve holiday paradise. The local fruit market Pera is within 5 minutes walking distance. The fishing village of Armacao de Pera with the best restaurants and nightlife of the Algarve is a 2 minute drive away. Albufeira and Portimao are 10 to 15 minutes drive away. The facilities include reception, laundry, facilities for food, drink and entertainment, a local pool, tennis court, a children's playground and game rooms. This property is ideally situated for visiting the historic town of Silves and the castle. 3 km away, guests can choose from three golf courses. This 4 person apartment consists of a bedroom with 2 single beds and a sofa bed for 2 people. Reception Opening Hours: November to January: 9am to 6pm. February, March, April, May and October: 9am to 8pm. From June to September: 9am to 10pm. In case you need to check in after Reception closes, please inform us on the day before.